In case you missed it I recently posted my vanity on Instagram (here) and I promise you each product serves a different purpose! 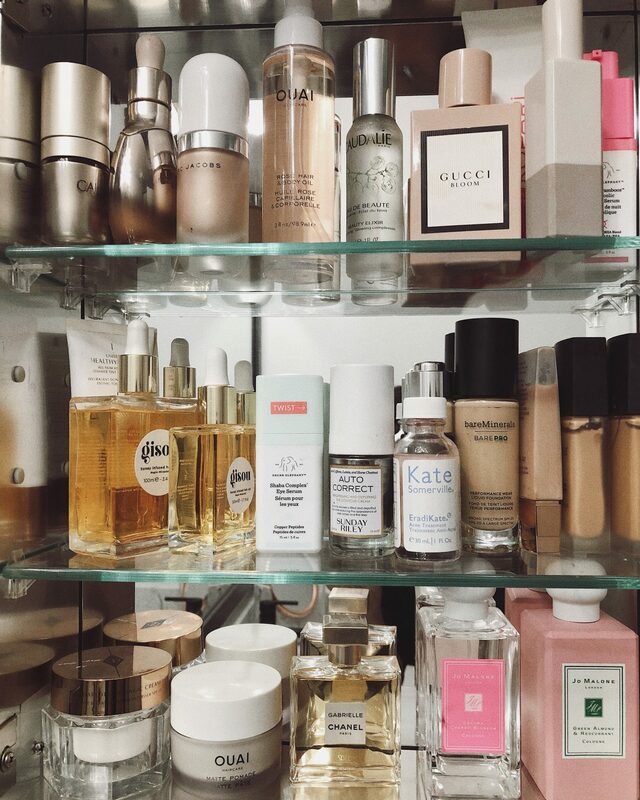 Since I am lucky enough to try so many beauty products out I want to make sure I share all my favorites with you including a few must-haves that have really helped my skin look glowy (aka alive) this past year, which I remind you has been on very little sleep thanks to River and Rumi. Weather you’re a mom, student, or young professional you don’t want to miss my faves below, as well as links on where you can buy it! Gisou – This hair oil is SOOO good. It’s rarely in stock but I found it for you! Hurry before it sells out again. Not only does it come in the most beautiful packaging but it’s also made of honey and tons of other natural ingredients. All so very hydrating for your hair. I’ve noticed such a difference using this hair oil before I blow dry and even after! Sunday Riley Auto Correct – I see this more as makeup for under your eyes rather than an eye cream. It instantly hides any dark circles and smooths out your under eye area. Jo Malone Perfume – Can’t go wrong with Jo Malone scents. They are so fresh and floral – may fave combo. Caudalie Eye Cream – This eye cream is cooling and best part it has caffeine in it to help with puffiness and dark circles. Charlotte Tilburry Magic Cream (currently has a gift with purchase) – Love using this cream before I put on make up. It’s super hydrating and really smooths out your skin. Drunk Elephant Glycolic Acid Serum – This stuff makes your skin feel new and fresh. I only use at night and wake up with glowy skin! Marc Jacobs Dew Drops – This is a major game changer. Any time I dab on this highlighter I get tons of compliments and questions about what I wearing. Gucci Perfume – This had been on my wishlist for so long. It smells amazing and fresh, and lasts all day! Kate Sommerville EradiKate – If you see a blemish coming in this stuff zaps it right before it can get any worse. The Ouai Rose Hair & Body Oil – This stuff smells so good, and best part you can use it in your hair and on your body! I love their dry foam shampoo too! Next Post Style MBA x Cheerily! You’re right about Jo Malone- my cousin got me a gift set of candles and I love them! Need to try the perfume thought!